Strawberries and Buttercups: Are you ready for winter? I first went in search of some flat shoes which I bought from Clarks and have been wearing since September and love them. They are just so comfortable and everyone always asks me where I got them from. I get vouchers for Clarks so got quite a bit of money off too. 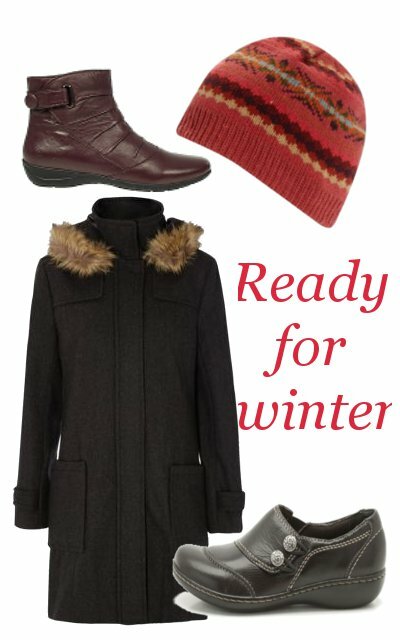 My next step was a coat and boots which turned in to such a nasty task of looking for something as I wanted flat boots and a coat with a hat and no fur on. I went to every shop I could think of but found nothing, my sister and I went to M&S but found nothing, the following day my brother and I went to the White Rose center and yes you guessed it found nothing! Majority of the coats are hatless but those that were with hats had fur on them but in the end I told my brother there was no point in spending £80- £100 on a coat there when Matalan had many for half the price so I might as well just get one from there. Which is where I got my coat from along with my hat which someone described me as cute when I wear it which I don't know if I was meant to be flattered with or not. I love the hats with ears but think I'd look insane with them on but I hate hats with bobbles as they remind me of my childhood (along with the duffle coats that seem to be making the rounds again, I hated them then and hate them even more now). Thankfully this hat fits me nicely and covers my ears as I've had some that don't. I got another voucher for Clarks but I did not find a pair of flat boots there which was so disappointing as after all I could get 20% off. Also I could have bought a bag but didn't see any that were my style but loads that I liked of course. I ended up going to the White Rose Centre again but this time with my sister as she wanted to buy my niece a dress for a few weddings coming up and its gorgeous. Whilst there I looked at shoes and ended up buying these from Barrats which we used to have in Bradford but don't anymore. I could have got a black pair but decided I wanted something different as I always get black. The price made me think twice I know they will last me at least this and next winter (I hope so anyway). I've bought myself some gloves too from Primarks and will get another pair so that I can keep one at work and one at home. I hate the fact that I can never find what I want but once I've bought it the shelves are filled with that thing. Do you have a similar luck to me? I tried buying in August but nothing was really out then, so far the weathers great but I think after such nice weather this month we are bound to have a nasty winter so I want to be ready for it even though I've just made do with what I can find. I've still got my trusty stuff from last season, unless I happen to find a longer coat for an insanely GOOD price (which isn't terribly likely to happen). A lot of our coats have "fur" on the hoods and sleeve cuffs, but I'd say at least 80% of them, it's always synthetic fur, so it's never anything real. The only real fur that I have is on the pair of mukluks that my uncle made for my mum (that I "steal" and wear from time to time) when he lived up North with the Inuit. Based on it's origins/creation, it doesn't bother me too much to wear it. My current coat though, it has a fur edge on the hood, but I made sure it was absolutely synthetic before I purchased. I tend to keep stuff but with knowing I could be outside for 45 minutes and I'm prone to getting colds I wanted something that would keep me wrapped up and comfortable... I actually have a hatless winter coat from about 3 years ago which I could have used.